If you’re like us, then your mind may already be turned towards Halloween as the days draw in and the nights get creepier. Will you dress up as a wizard, a zombie scientist, a skeleton, or something even more bizarre? For lovers of insects and cool tech, why not consider an epidermal robot? Researchers from Stanford University and Massachusetts Institute of Technology recently presented the SkinBot: a robot that actually climbs on the skin! Sadly, the motivation for this research was not unique costume ideas—the robots were designed to assist with health data collection. The 2x4x2-centimetre robots use a suction mechanism to move across the human body, a bit like a cross between the Terminator and an inchworm. They can perform electrocardiograms, record electrodermal activity, take images of the skin, and capture inertial body motions to study posture and subtle cardiorespiratory vibrations. Whilst the long-term potential of the SkinBot is clear (as well as a bit spooky), this entomophobe is happy to stick with her human doctor for the time being! Recent work from the University of the Witwatersrand in South Africa has ignited a debate about our understanding of dinosaur evolution. Researchers presented the Ledumahadi mafube, a new sauropodomorph species that would have weighed about 12 tonnes—making it the largest animal to walk on earth in the early Jurassic period (as well as a challenge for us to even picture in our heads). Using the ratio of thigh and arm bone circumferences, it’s argued that L. mafube walked on four legs initially. However, palaeontologists know that later sauropodomorph species were bipedal—and yet later later species were quadrupedal! The argument that the sauropodomorph lineage gained, lost, and subsequently regained quadrupedalism has walked the South African scientists into a fiery debate (as the conventional theory is that quadrupedalism evolves only once in a lineage). Although you don’t want to see your average palaeontologists locking horns that often, we look forward to seeing the next debate inflamed by ancient bones! Do you love your fitness tracker and worship the sun? Then researchers from the Royal Melbourne Institute of Technology have just the gadget for you! Full disclaimer however; it’s only in the prototype stage (but we really think it will be worth the wait!). The team developed a wearable sensor that will alert you when you reach the maximum possible dose of exposure to UV radiation, based on a choice of six skin types. Wearing sun cream? Slap it on over the top and the sensor will work just the same! Judging by some of the dodgy tans we had at BioStrata HQ this summer, we really ought to be jumping on this tech as soon as it’s available! Can’t wait to cut back the crispy skin? The chemistry is fairly straightforward and only requires filter paper and some colourless ink. The ink contains polyoxometalate, which turns permanently blue when exposed to UV. As the ink is exposed to the sun, the paper becomes darker and darker until the maximum safety exposure limit is reached. This cheap, single-use technology has the potential to light up our beach experience—a real feather in the sun cap for the Aussies. 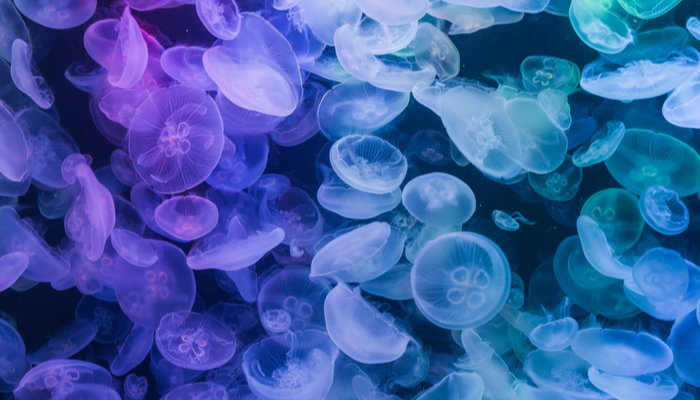 An international team of scientists has presented some surprising new evidence about the humble jellyfish: everyone in the ocean loves to eat them! Traditional research methods such as cutting open the stomach of predators rarely uncovered any evidence of jellyfish consumption. This meant researchers were forced to conclude that jellyfish really weren’t all that tasty (hard to imagine, I know). After all, they do have poor nutritional value (about 30X fewer calories per gram compared to your run-of-the-mill fish) and not to mention it’s a snack that can attack! But new methods such as DNA analysis of faecal samples (we don’t envy that researcher), has found that jellyfish are eaten by a wide range of marine predators. Some scientists are excited by this because they argue that jellyfish can act as a sort of ‘buffer’ in the food web. If an ocean is depleted of all its fish, then large predators have nothing to eat. Jellyfish, on the other tentacle, can survive on zooplankton if necessary. This means they act as a last resort for predators—bringing new hope that we might have a shot at saving our oceans. And finally, scientists have been investigating the evolution of Drosophila suzukii, and they've noticed that the females of this invasive fly have a rather unusual ‘ovipositor’ (the technical term for their genitalia that we’ll tactically use here). Unlike other fly species, the ovipositor of D. suzukii is serrated and saw-like; a great adaptation to have for piercing the hard skin of ripening fruit. As you might imagine, this adaptation is less than ideal during copulation. Unless the male’s genital form is in the Goldilocks zone, the female’s ovipositor just seems to get in the way. Nature’s answer to the friendzone, perhaps?